I live in the USA. When I talk to people here about big goals, important moments in the world of hockey, the 1980 “Miracle on Ice” team’s win over the Soviet Union comes immediately to mind. And it should. It was a great moment for US hockey and Al Michael’s “Do you believe in miracles?” call is one of the most well known in sports. But growing up in Canada, that moment pales in comparison to another one that occurred almost 8 years earlier. It was the final game of an epic 8 game series between Canada’s best (plus 1 American and 1 Czechoslovakian) against the best in the USSR. USSR started off well, finishing the first 4 games of the series (all played in Canada) with 2 wins and a tie. Canada had to go to Moscow and win 3 of the 4 games to win the series. Then they lost the first game in Moscow. That meant they needed to win all 3 remaining games to win the series. 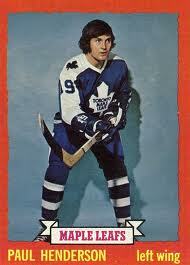 Let me introduce to you Paul Henderson. I heard him speak at my church years ago, but being too young to have experienced the Summit Series, I didn’t really know the whole Henderson story. A talented winger, Henderson had spent a decade in the NHL. He had scored 20 or more goals in a season 6 times and gone over 30 twice. He joined Team Canada for the Summit series and as it would turn out, would become a house hold name from coast to coast with what would transpire. In game 6, Canada scored 3 goals in less than 90 seconds. The third, scored by Henderson, turned out to be the winning goal. Game 7 came and Henderson scored with just over 2 minutes left in the game to break the tie and send Canada to a 4-3 win. That set the stage for the 8th and final game. Each team had won 3 and there was 1 tie. The winner of game 8 would win the series. 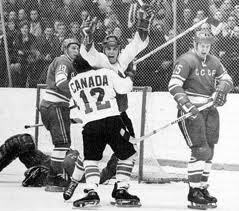 The first period ended 2-2, the USSR scored 3 times with Canada only managing 1 so with 20 minutes left, USSR led 5-3. Canada got an early goal in the 3rd period, and tied it up with just over 7 minutes to play. The stage was set for a dramatic finish and it was delivered, again, by Paul Henderson. Here is the final scene, as it was called by Foster Hewitt. For those of you keeping score at home, that is 3 game winning goals in a row in the games that decide the series. 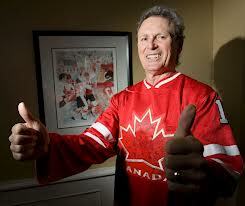 If anyone in hockey-crazy Canada didn’t know who Paul Henderson was before this series – the knew him now. But something that I have really come to understand from looking into the stories of pro athletes. The success that they have never fulfills them. As you can read in this post on Heaven4sure.com, Henderson, despite the success and fame he had as a result of the Summit Series, still felt empty, angry and bitter. Life was still hard, and his best coping strategy was drinking and partying. Then came the knock on his door. It was Mel Stevens, a friend and mentor of Henderson’s that wanted to invite him to help out at a Christian Hockey camp. That started 2 years of Bible reading, question asking, soul searching time for Henderson that led him, on March 12, 1975 to choose to live his life to honor God. To this day, Henderson calls that day the most memorable and best day of his life! How many times do we need to hear how the things of this world are unsatisfying and that God is the ONLY thing that satisfies. May our hearts beat only to attain that which God calls us to. Let’s not to be distracted by the temptations of this world. Let’s boldly follow Him, and invite others to do so too. I am on vacation in Canada this week, and so, as a tribute to my Home and Native Land, I am going to share the story of the guy who has one of the most pressure filled jobs in all of sports – Starting goaltender for the Toronto Maple Leafs. The Maple Leafs and Montreal Canadiens are neck and neck for being the team with the combination of craziest fans and tightest media coverage and scrutiny of any of the pro sports. They have the fans that are the most excited when teams are doing well and most vocal (as in booing) of teams that are doing poorly. They also have the tightest, most intense media coverage anywhere, and what I believe gives the Maple Leafs the edge at being the most intense place to play is that they have gone longer without a championship – it has been 45 years since they last hoisted the Stanley Cup. I’ve written on this blog about finding a way to express your faith in little ways. Ben Zobrist of the Tampa Bay Rays and Matt LaPorta of the Cleveland Indians use Christian music as their walk up songs, Colin Kaepernick shares how his tattoos reflect his faith in God. Reimer has chosen to use his goalie mask to represent his faith in God. As you can see in the picture below, he has an image of Jesus helping Peter out of the water after Peter had been walking on water and began to sink. 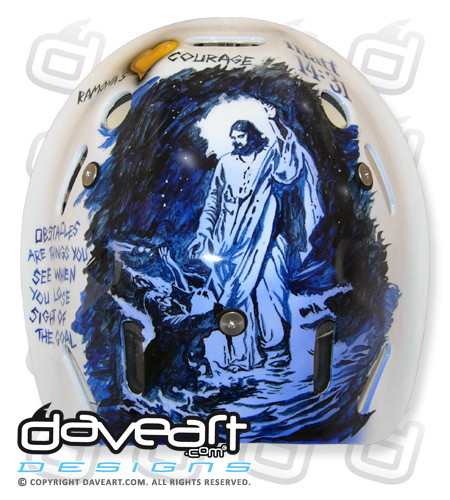 The image from the back of one of Reimer's goalie masks. We can all tend to allow doubt to make us hesitant to act, but like Peter, when we step out in faith into something that seems challenging, unlikely or even impossible, we are amazingly met by the God who can do the impossible. 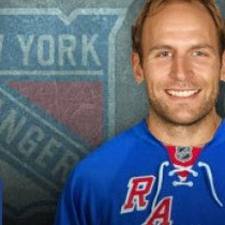 I am not a Rangers fan, but as I search for articles about hockey players to write about, the Rangers keep on surfacing, and so, here we go again. So far the Devils/Rangers series has been pretty closely contested. The teams seem to play close game against each other, and it would surprise no one if the series went 7 games. If it does, one player in particular will have been there before. 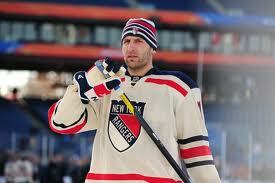 In fact, He has played in 2 game sevens this year, and 6 overall in his career. Truth be told, the first playoff goal that he ever scored in the NHL was the game-winning goal in game 7 of the Stanley Cup finals in 2003. Michael Rupp is the first player in NHL history to have his first ever playoff goal be the cup-clinching goal. It was a great moment! Talk about living every kid’s dream (or at least kids that dream about hockey) game 7, game winning goal – the only thing that would make it more dramatic is if it was in OT. The Devils won this game 3-0 with Rupp scoring the first goal, and assisting on the other 2. What a way to cap a rookie season. And when you make it all the way to the cup-hoisting ceremony as a rookie, there is a temptation to believe that you will be back often if not every year but as you can read in this article from cleveland.com, it doesn’t take long to realize that that isn’t the case. Now, half way through round 3, against the Devils, the team that drafted him and the team with which he won the cup 9 years ago, the Rangers are closing in on the team’s first final since 1994 and Rupp’s first trip to the finals since that championship night in 2003. It hasn’t been a breeze for Rupp, There have been some challenges to his career. There was some time spent in the minor leagues trying to earn a spot in the NHL, some frustration and thoughts of giving up. Then there was also a heart condition reached it’s most severe shortly after that Game 7 goal. This condition would boost his heart rate up to around 300 beats per minute. With health a concern, and a wife and 2 kids (at the time) to consider, heart surgery was the route taken to deal with this issue. It was a success. His career was able to continue. You can read his story as told to CBN at this link. In this story, we also read about his conversion to Christianity. His wife, Christi helped answer questions that he had about who God is and led him to Christ while they were still dating. Like so many others that I have written about, the frustration and disappointment that he faced as he battled to the NHL began to diminish when he decided that God’s plan was trustworthy and keeping God ahead of Hockey on the priority list was necessary. In this article, some of the things we learn about Rupp resonated with me. 1- We all reach many points in life when we are ready to quit, to give up. It is amusing that some think that once you choose to live for Christ, everything is easy. Quite the opposite is true. Knowing God and understanding something about how He calls us to live well, that is very hard. In fact, it is impossible to live up to those standards, that’s why we need a savior. It seems pretty obvious, and is a common theme among many – in the sports world or not. We all have our ideas of how everything should go. We all have these notions of how we want God to work. And we all have experiences when these simply are not the reality we live in. The onus is on us to stop trying to live for ourselves or to please others, and live in a way that honors God. 2- Do not take opportunities for granted. Rupp started his career with a victorious trip to the Stanley Cup finals. He talks about how then it is easy for the expectation to be to go every year. But now, 9 years later, he still hasn’t been back (although the Rangers are just 2 wins away from the cup final). This made me think of how hesitant we can be to boldly share about our faith in God with others that do not know Him. We think that we’ll get more chances and we can let the current ones go by. But we don’t know how much time we have here – so it is important to make the most out of every opportunity. Not for our own success or renown, but for God’s glory and for their eternal destiny. Don’t put off sharing God with others. They may need to hear it. Make the most out of each experience, as God leads you. You never know what opportunities will be presented to you. Rupp was successful on his first trip to a cup finals, but did that leave him satisfied? No, he is still anxious and hopeful to return for another chance. Sharing our faith is like that, too. It can be intimidating and scary at first, but when we go through it and share what God is doing in our lives, or we help someone understand the difference that he can make in their life, We get excited and look for more opportunities to share about God again. Rupp is also taking opportunities to share God’s love and faithfulness with others. He is also an instructor at the Hockey Ministries International hockey camps that happen all around North America. The Rangers are up 2-1 against the Devils. 2 more wins will give Rupp another trip to the finals. 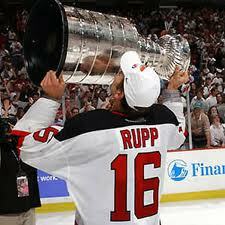 After 9 years in the NHL, Rupp may get another chance to hoist the cup. Keep watching to see if he, and the Rangers prevail. Also, keep watching and listening, and praying that Rupp will have opportunities to reflect God through his play and the platform of NHL. Earlier this week, the New York Rangers pulled off an incredible comeback in game 4 of their playoff series against the Washington Capitals. Down by 1 late, they scored the tying goal with 7 seconds left in the third period. Then, just over a minute in to Sudden Death OT, Marc Staal scored the winning goal, pushing the Rangers to within 1 win of reaching the semi-finals. It was a big goal for Staal, and a great set-up for a look into the story of the hockey-playing Staal brothers from Thunder Bay, Ontario. 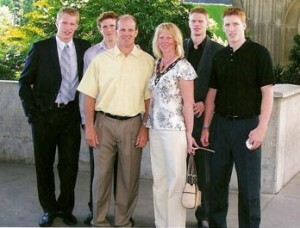 Also, as we approach Mother’s day, a big part of the story of the Staal brothers, is their mother, Linda, who like many Canadian mothers, watched her kids grow up from the bleachers of the chilly ice rinks where her 4 sons honed their hockey skills. She has had those efforts rewarded, too, as 3 of her sons Eric (Carolina), Marc (New York Rangers) and Jordan(Pittsburgh) are significant figures in the NHL, and the 4th, the youngest – Jared – is working his way toward the NHL, currently playing in the Carolina Hurricane’s system. And while Marc is the only one left playing as this years playoffs wind down, we will look at all 4 brothers, and the foundation for faith in God that was put in place by Linda and their Dad, Henry. Or read about him and a couple more star Christian hockey players at this link from Living Light Ministries. I was unable to find any other articles that talked about the other brothers and their relationships with Christ, but mom Linda and Dad Henry have gone a long way to equip their sons with the foundation to look to God to guide their life. 1- As a dad, I am reminded of my duty (and joy) of telling my daughters about God’s love, and Jesus’s sacrifice (and our desperate need for both). I appreciate Linda Staal’s efforts – devotional books and prayers for her sons, as well as understood church attendance and family devotional times when the boys were younger. I am challenged to make every effort to give my girls the knowledge of who God is and the understanding of how desperately we need him so that they can forge a true and genuine relationship of their own with Him. It brings to my mind the heartache of not being able to choose to follow God for them. I wish I could make the decision for them – but that just isn’t how it works. It is up to them to take the knowledge we can give them, as well as the modeling that we can do and then chose for themselves if they are going to follow God or not. This is definitely a constant reminder to be faithfully praying for them every day and living out my relationship with God in a very visible way. 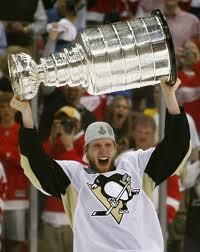 2- Eric Staal won a Stanley Cup in 2006 with the Carolina Hurricane, Jordan Staal won a cup with the Pittsburgh Penguins in 2009. Now, in 2012 will it be Marc’s turn? That remains to be seen. Marc Staal scoring the OT winner vs Washington - Cup Champion 2012??? 3- As Mother’s Day approaches, and we looked at the Staal’s mother in this article, I would like to say Happy Mother’s Day to my own mother, Nellie, and thank her for living out a visible faith for us to see. My brother’s and I are living God-centered lives and see the importance of passing the same on to our children, too. Thank you, Mom, for helping to make God such an important part of our lives. Ahhh! How I love trips down memory lane. 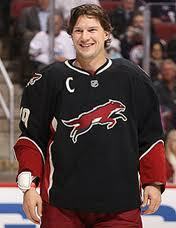 And Memory Lane welcomed me as I looked in to the story of today’s subject – Shane Doan, captain of the Phoenix Coyotes. As a young boy, I remember like so many of us, getting up early for Saturday morning television. It was mostly cartoons, but I do remember watching “Circle Square” a 1/2 hour show that featured (if memory serves me) singing, puppets, actors and a story with some issue or dilemma and an eventual solution that pointed to Christ. At the end of each episode, there would be a commercial for the Circle Square Ranch (there were a few of them scattered across Canada). Archery, horseback riding, camping life – the placed looked like paradise to my 8 year old eyes. What does that memory have to do with Shane Doan? Well, as you can read in this article from Canadian Christianity, Doan grew up on the Circle Square Ranch in Halkirk, Alberta, that his parents owned and operated. He was active at the camp and saw a genuine faith being lived out in the lives of his father and the ranch hands at the camp. And with these solid examples all around him, he began a genuine relationship of his own with Christ at the age of 12. I am the main leader for the 5th and 6th grade ministry at church (here is the Imprint 56 blog). One of my main drives in working with youth is that I want to do whatever I can to help them form a genuine relationship with God. It is so important to have a solid, personal foundation on Christ so that as the difficulties and trials of this life come against them, they can rely on Christ to lead them to make right choices. This is the testimony of Shane Doan. Check out this story from Christianity Today’s Ignite Magazine. Here we read that Doan, at the age of 15, on his own, and 600 miles from home, he took a stand and chose not to compromise his beliefs and give into the temptations that his teammates were inviting him to. He was not judgmental of them and their activities, he just decided that they were not for him. We can’t expect those who don’t have a relationship with God to follow his laws and live by his standards. He speaks a great truth in that if you take a stand the first time, it gets a little easier each time after that. Shane Doan has carved out quite a nice career in hockey. He has played almost 12oo NHL regular season games, tallying just under 8oo career points with a longevity that saw him play for the Winnipeg Jets (who drafted him #7 overall) before they moved to Phoenix in 1996. He has also competed in the World Championships on 5 occasions and was a member of the 2006 Canadian Olympic Team. The one area in hockey that he has not been very much is Stanley Cup playoffs. Going in to this spring’s run, he has played only 39 playoff games – never playing a game beyond the first round. With the career that he has had, and the message he shares, and the fact that I really liked the Jets the first time they called Winnipeg home, it is easy to hope that Phoenix keeps playing this spring for a while. Next to Zdeno Chara of the Bruins, Doan is the captain that I most hope to see hoist the cup in June!